‘Hello everyone, thank you for joining me. 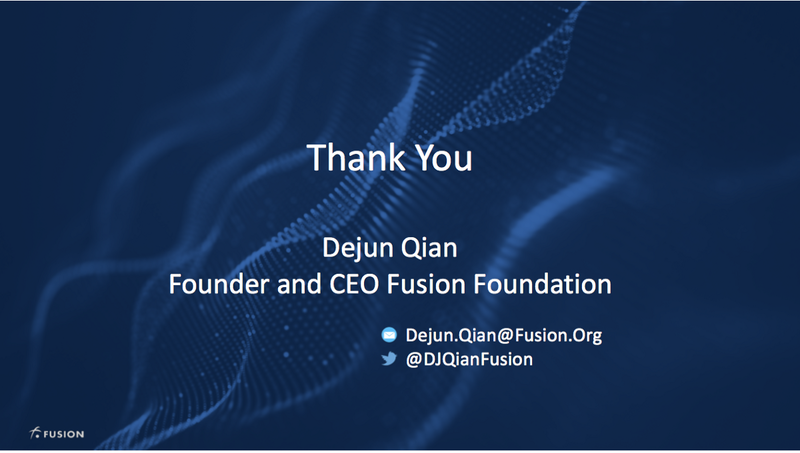 I am DJ, CEO and founder of Fusion, and am very excited to share with you a new perspective on financial transactions. Like many of you, I believe that tokenization of everything and the internet of value is the next natural evolution of a global, connected, and efficient market place. 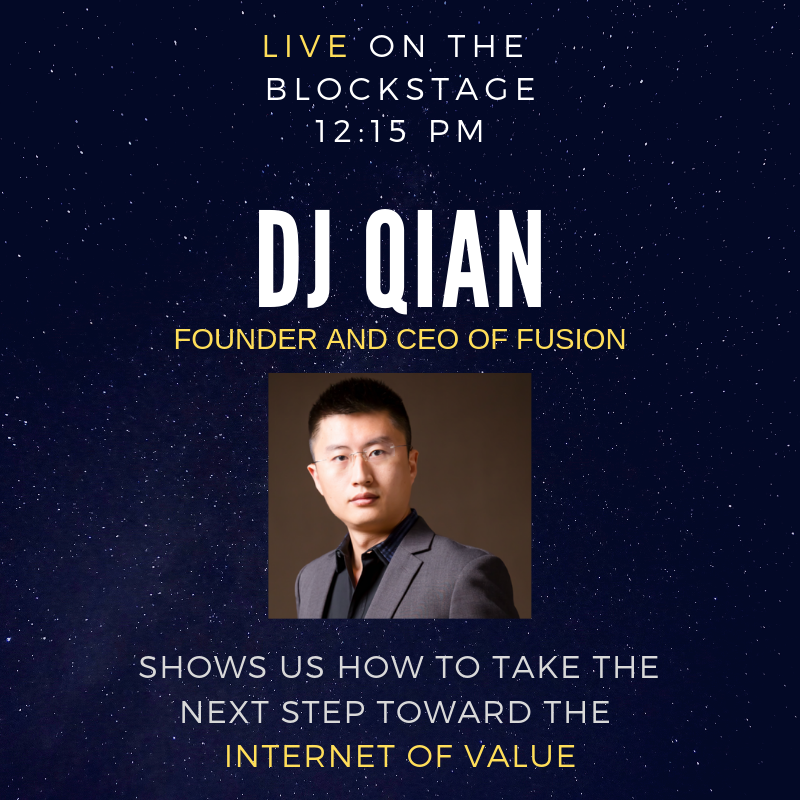 Today, I will discuss how the concept of Time Value and viewing transactions that take place all around us as Time-based transactions can lead to new and simpler ways of value exchange. What you see behind me is the equation for what’s called, the present value of your money. The equation is simple — my present value is my future value, divided by how much return I can get over the period of time from now, to the time of the future value. You can see, that important variable in blue is “time periods”. The more time passes, the bigger that variable becomes, and we remember math — if I divide one number by a number that gets bigger, what happens? That’s right, I end up with a smaller number. Thus, $1,000 today, is worth a lot more than $1,000 in 5 years, and a lot more than $1,000 in 10 years. By extension, if money is just a measure of an asset, then that means every asset around us, must have a time value as well. And this is where I want to challenge your thinking. Every asset’s value today, is determined by the value of that asset over its lifetime. For example, a house has a value stored over its lifetime of hopefully a century or two. Well, the way some houses are built today, maybe it’s a life time of just a few decades. Over time, if you do not maintain your house, the house value starts decreasing as things break down. Some of you know this concept as depreciation. The opposite of that of course, is appreciation. For example, buying a house in Shanghai where I am from just 10 years ago, has obviously appreciated heavily in value. Suffice to say, I think you all understand and agree with my statement of an asset having time value. Now I want to further stretch your thinking. What if I am able to somehow extract values of your asset in the future and give it to you today? 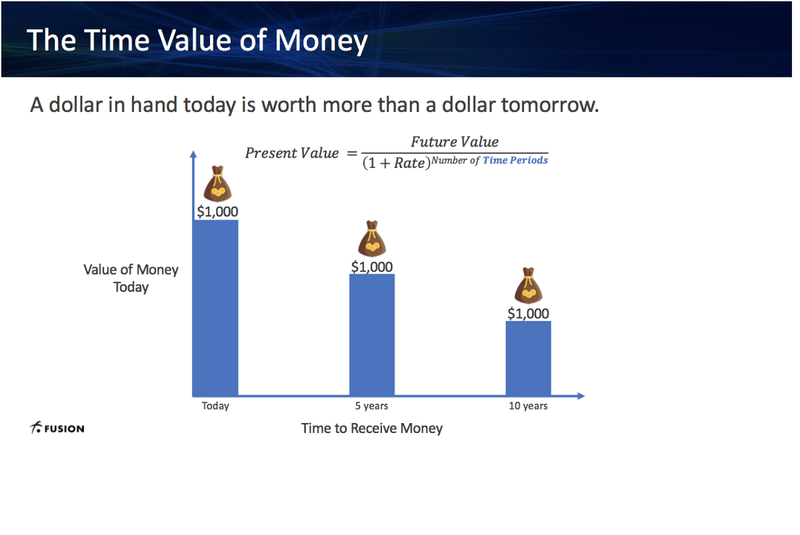 And, just as money in your hand today is worth more than money in your hand tomorrow, if you can somehow get future time value that is locked in your asset today, the value will be worth more to you. In fact, some of you have already been doing this, and for sure, financial markets have been doing a wonderful job of this over the last two decades. In fact, as the statement behind me says, over $1 quadrillion dollars of wealth innovation has been unlocked in the market. How? They are known as derivatives. You all have been wondering what these blocks behind me represent. Any guesses? These monoliths represent assets and their value locked in time. The first, lowest rectangle represents an asset where no time value has been extracted. Think of this as the currency or cash when it was first put in motion, or the cash that sits in your wallet even. The $1 bill will remain $1 today, tomorrow, 10 years from now. What you can get in 10 years from now for that $1 will likely be a lot less than what you can get today thanks to inflation, but that’s a separate topic. Another example of this asset can be a house which you purchase, in cash, and live in for the rest of your life and take out no mortgage. This second slice, represents an example where the owner has extracted a single time value, in this case, the front-end. A good example of such an instrument is debt. The cash holder lends out his cash for interest, as opposed to just sitting in his wallet, and knows that the cash will still come back to him after the maturity or end of the debt agreement. Obviously, there is some risk involved on who the cash is lent to — but assuming the borrower does not default, the value that has been extracted from this cash has been increased, and hence its value to the owner is bigger than in the first case. Another example of this slice is if a house owner pledges the asset he owns as collateral for debt. For example, his house is worth $500,000 and he is able to take out a $300,000 loan against his house. So, his house that he currently lives in, has now generated additional capital for him, and even though the price of the house may not have changed, the value of this house to the owner is now more than it was before. By now, you must know then what this last slice must represent. It represents a value where multiple time values have been extracted. The front-end slice can be debt as per before, or there are many more transactions that you can no doubt think that fit the model where front-end time slices are extracted as value to the asset owner, while the asset owner still retains the benefits of the back-end time slices. That’s my challenge to you if you haven’t thought of any. So how can a person extract these future time slices — is it even possible? Well of course it is, and it’s already being done today in the financial markets, or even in the trade markets. Maybe you all have heard of futures? Either equity futures or commodity futures? It is a financial instrument that lets a person buy an asset for a set price at a certain future date. Futures trade in equities, FX, commodities — -but since we’re at a blockchain summit, let’s pick a crypto-, the most obvious one — bitcoin. Today, it’s trading somewhere in the neighborhood of $4,000. If I buy a 3 month future bitcoin at $4,100 today, this transaction means I believe that in 3 months’ time, the price of bitcoin will be at least $4,100 or better. For the financial experts in the room, I am ignoring cost of carry and leverage from margin — this is meant to be a thought exercise! I can then pair this 3 month trade and sell a 6 month future at $4,100. This transaction is exactly one of the blue slices here in the back. We’ve extracted 3 months of value out of the asset today, while the asset owner still holds the other time slices. Futures and forwards are used for speculations and for hedging, and we only have half hour today, so I unfortunately cannot go into any more detail. But let’s put aside the futures market and go with a simpler example — Let’s replace this asset here with a house. And instead of futures, let’s put in place a hotel, or a sharing platform like AirBnb. The house owner rents out the house for set periods of time in the future, that’s these slices of blue, while the owner still has the house on his balance sheet. 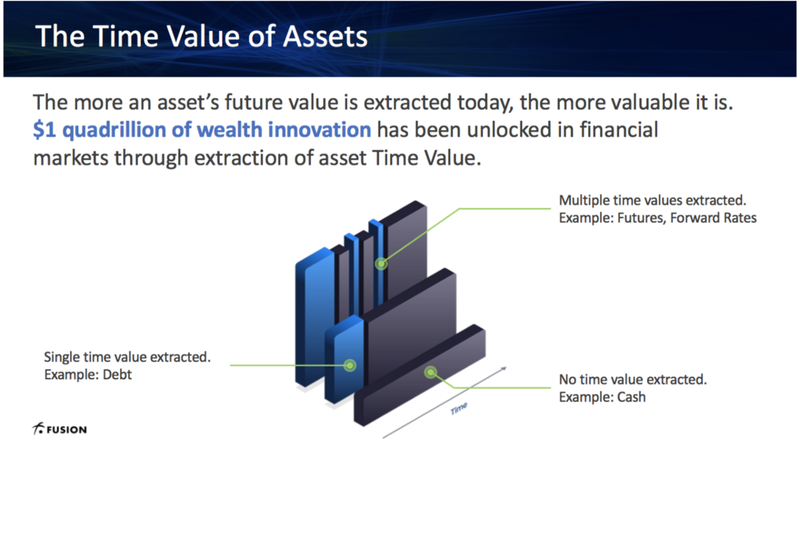 You all get the idea of what I am saying: Just like money, every asset has a value over time. And the more creative we are at extracting future values of the asset today, the more that asset is worth to us. All around us, whether it is in retail or sophisticated financial markets, people are trying to extract and monetize time value, which creates capital, which creates economic growth. 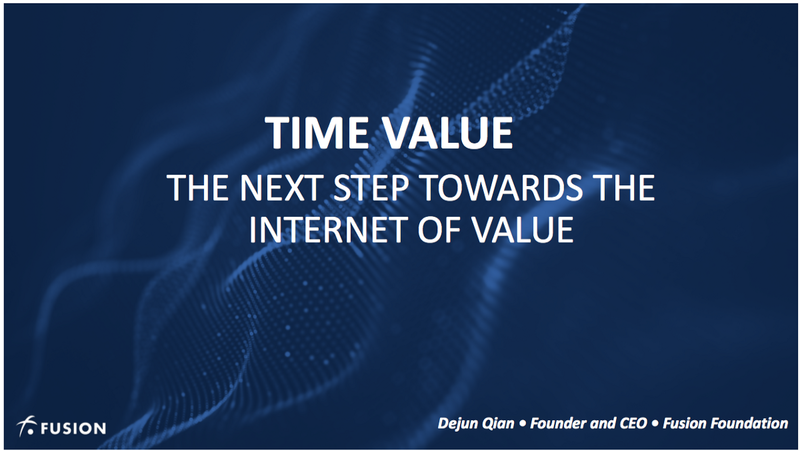 And if the Internet of Value is the future, which I believe it is, then understanding and enabling transactions through the lens of time is critical. So, what does a transaction look like through the lens of time? Every transaction can actually be simplified into three components, and time plays an important part in all 3 components. The first: What asset am I getting for what period of time. Am I getting a car for the rest of my life? Am I getting a car for 2 weeks? The second: What asset am I paying for what period of time. Am I paying in cash in full? Am I lending out my cash and getting it back in 3 months? The third and final: When am I paying and receiving these assets? AM I paying today for asset in 3 months? Am I paying in 3 months for asset in 3 months? Yes, there certainly is a lot of business logic that gets built on top of these 3 fundamental blocks, but that is all just “icing” on the cake. Here is an example of viewing transaction through my lens of time. Everyone knows AirBnB. Let’s approach this example form the viewpoint of the person who wants to rent someone else’s house for a week. The first component, the buyer pays cash in full in exchange for something. The buyer, is the renter. The asset he is paying upfront is cash. No loan, no future — just straight up cash. That means the time asset he is paying is what? That’s right, it’s the full lifetime value. The second component, the buyer receives the right to live in the house for 1 week. What is the asset the buyer receives? That’s correct, it’s already written there: it’s the right to rent the house. And for what time period is the buyer receiving? Yes, it’s 1 week of time value. And since you all have been paying such great attention, this means that the owner of the house has managed to extract 1 week of time value out of his house, without giving up ownership of his house and the underlying benefits of price appreciation (hopefully appreciation!). In the third and last component, the buyer pays today to receive 1 weeks right to live in the house 5 days into the future. So, we agree that everyday transactions are all just time-based transactions giving. And if we can model these 3 components, we can build a foundation that supports diverse applications to value exchange. 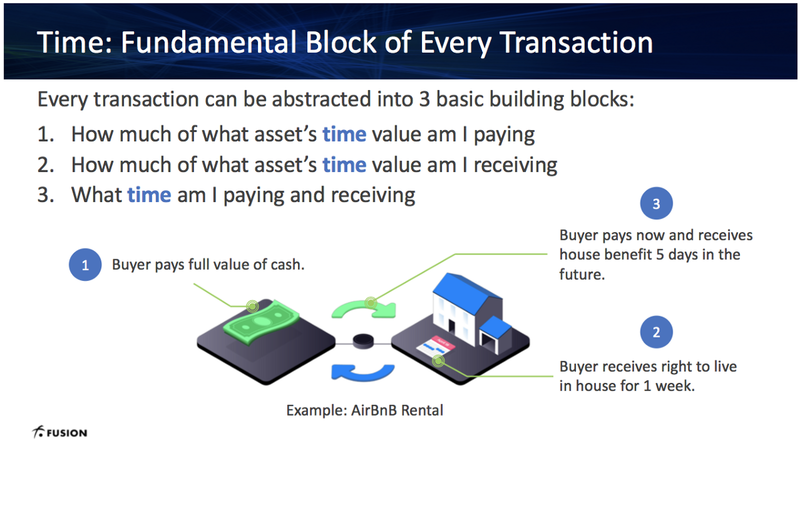 However, as the slide says, these 3 components are blocks of every transaction. Does that assertion hold true for sophisticated financial instruments? Of course, the answer is yes. Let me give you just two examples. The first, is an option. What is an option? It is a financial derivative, that gives the buyer a right to buy or sell an asset at a certain price and at a certain time in the future. I’ll leave to you to work out the 3 components here and email me if you can or can’t figure it out. I want to draw your attention specifically to the equation of the option. Financial experts, this is Black-Scholes and we are aware of the limitations of this model. However, suffice to say, it is still one of the most prevalent equations out there. Putting aside what the terms all stand for, I want you to focus only on the blue letters, which not coincidentally, are all “T”. Any guesses what “T” stands for? Yes, it is indeed time. Notice how time shows up everywhere. Time, the time period being purchased, the time of the purchase — is fundamental part of the transaction. The next example, is a bond model. Bond is just a debt, where a person or entity borrows money from another person or entity for a certain length of time, in return for paying out a certain interest rate. Your house or car loan, is just a bond. Again, I’ll leave it as an exercise for you to cast this in the three components of time-based transaction. 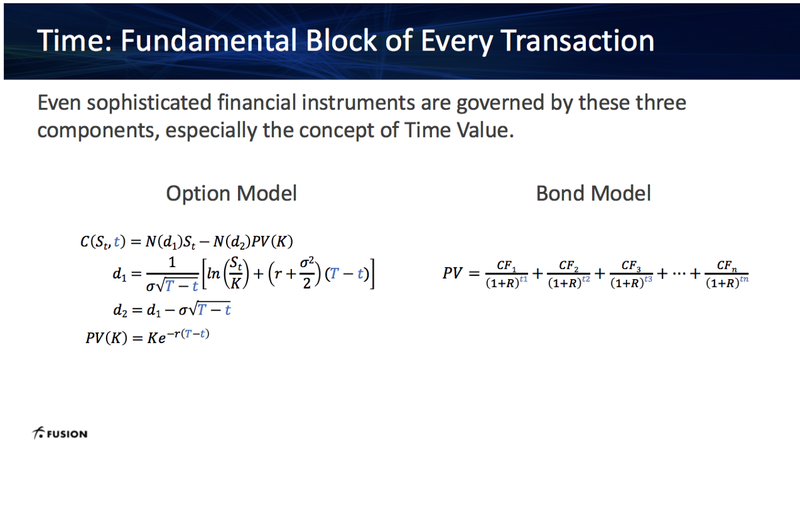 Same as before, I want to draw your attention to the impact Time has in modeling this instrument, and why I firmly believe that time-based transactions are such a fundamental part to our world of value exchange. 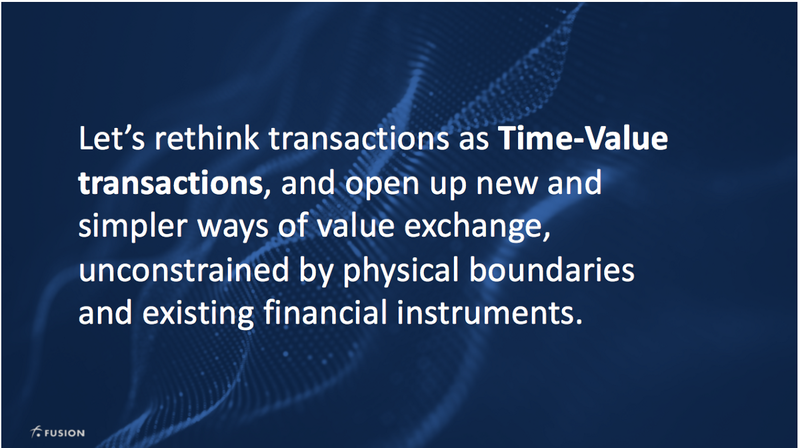 If there is one takeaway then, from the what I’ve said so far, it is this slide behind me, and because it’s so important, I’m going to repeat what it says: Let’s rethink transactions as Time-Value transactions, and open up new and simpler ways of value exchange, unconstrained by physical boundaries and existing financial instruments. If I haven’t convinced you yet, let me wrap up with 5 diverse use cases. Some of these use cases, we are actually working with partners to recreate on our platform already. A buyer will pay cash, or maybe some portion of cash. In return, the buyer receives right to access this asset for a period of time — hours, days, weeks, forever. The buyer can pay today, or at some point in the future, to receive this access today, or at some point in the future. The second use case: Future Song Royalties. What are future song royalties? Royalties are money due to a composer or singer for playing their song. A future song royalty pledges a portion of all earnings related to that song in the future, in return of some benefit to the song’s owner today. A buyer will pay cash today and in return, they will receive a proportion, let’s say 1% of all royalties earned by a song 6 months in the future to 12 months in the future. The composing group gets much needed capital today to survive, promote themselves, or fund some album. We are working with creative content platforms in both US and Asia to support this exact use case. 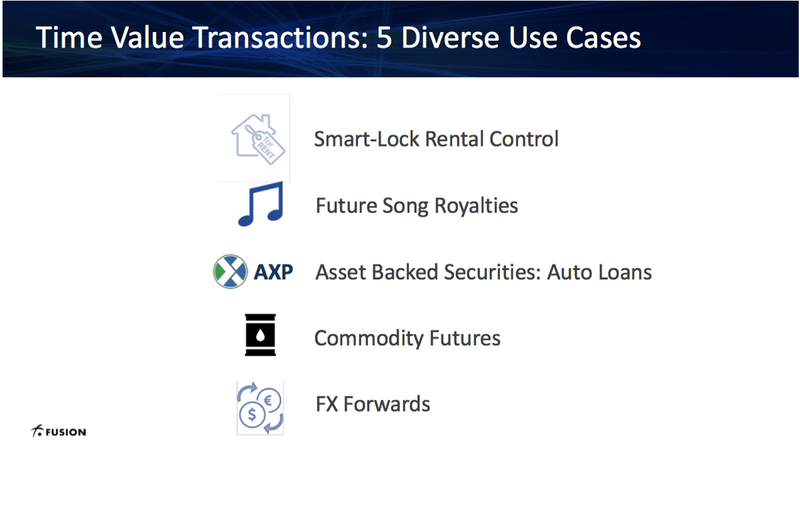 The third use case: Asset Backed Loans, such as with our strategic partners AXP. In particular, we are working on activating $100 million of auto-backed loans. I already explained debt before, and you’ll recall it was one of my challenges to you to cast into our 3 time-based transactions. So, it appears I will give you one answer. The asset backed security is an instrument where a buyer of the instrument lends out her cash, in exchange for some interest from the seller, which could be a bank or a borrower. To lessen the counterparty risk, such as the borrower not paying his debt, the borrower pledges a collateral — an asset that has value, such as his car. Again, here, we have time value being extracted on both sides — on the lender side, it is her cash. On the borrower side, it is his car. We will look at this from the viewer of the debt buyer. The debt buyer lends out her money today for a period of time. If your recall the picture of debt, she is lending out the front-end slice of her money. She still owns the back-end slice of the money — provided the counterparty doesn’t default of course. In return, she gets interest that is paid to her over a period of time, throughout the life of the debt. The fourth use case, very relevant to the Middle East, are commodity futures. Commodities are things like gold, oil, soybean. Futures are financial instruments that let people hedge their exposure or speculate. The commodities future market is a multi-hundred billion dollar market. Since I deep dived into futures both in my initial presentation on time value and also in future songs royalties, this use case is very easy to grasp. The buyer of the future pays today in cash for a right to receive the commodity at some point of time in the future. In other words, the buyer is buying a future slice of the commodity. For our financial experts, I do understand that not all futures settle for physical delivery — that is, not all players in the commodity market actually choose to sell or receive their physical barrels of oil. That is the level of innovation with financial derivatives — being able to unlock future value of assets that neither side owns! My point in providing this use case is that, as I mentioned before, if we provide the ability to create futures through time-based transactions, the asset class, the market — can be abstracted away. The fifth and final use case, is FX forwards. FX stands for foreign exchange and forwards are instruments that are very similar to futures — they give buyers and sellers of forwards exposure to an asset class at a set price in the future. An FX forward is very important for the import/export economy. Import/Export economies always deal with FX risk — that is a risk that comes from a timing problem between when goods are manufactured, and when they are actually paid. Because the goods are manufactured in one country with a currency, and sold to another country in a different currency, FX exchange rates may change wildly and impose a loss on the exporter. For example, a sunglass exporter manufactures $500,000 worth of goods in Q1, which is bought by customers in Dubai throughout Q2 and Q3 in Dirham. The Dollar:Dirham exchange rate may change from today’s rate and hurt the exporter. Therefore, the exporter can lock in today’s exchange rate in a transaction known as FX forward. That is, the exporter sells his asset of USD for 3 months in the future and 6 months in the future, in return for Dirham in 3 months and 6 months, at today’s exchange rate. So, this transaction monetizes the back-end time slice of both the asset being paid — USD — and the asset being received — Dirham. And the time of execution is today. And that’s my message today: time-based transactions define all forms of value exchange around us today. Enabling the extraction and exchange of time value across all assets will be an economic multiplier for the economy, and the next step towards the internet of value.